It was another delightful night at Pickin' on the Patio. Perfect weather and a good number of performers and observers. 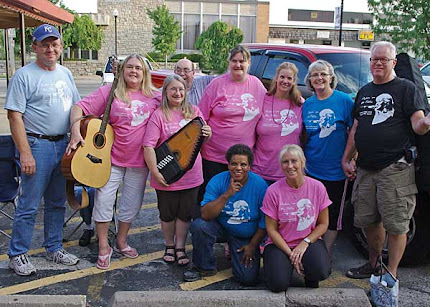 Next week, August 31, will be the last Pickin' on the Patio until June 7, 2010. Join us one more time this summer and start getting your stuff together for next spring. It was another beautiful night Monday with plenty of pickers, singers, and watchers. We have been blessed this year with mild weather for Pickin' on the Patio. This week we had some cowboy songs, spiritual songs, a little tribute to Woodstock, as well as our usual assortment of country, pop, gospel, and rock tunes. We have just two weeks to go for the season, so come out and enjoy the live, impromptu music for two more Mondays before Labor Day. There is such a variety of music and skill leveles that we never know what is going to happen. 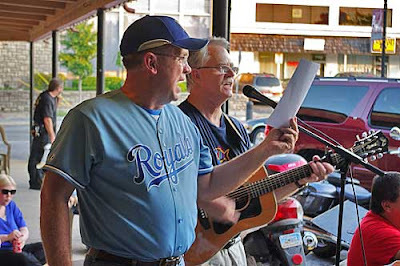 If you have never played before or if you have been playing professsionally for 5o years (we have both) come on out to Homer's on Monday nights. After an afternoon storm, the evening turned out beautiful for Pickin on the Patio. There was a large crowd and plenty of good music. Thanks to everyone who partcipated. Three weeks to go for this season. Sky Blue will be at Homer's this Saturday, so everyone be sure to be there. Last night the heat caught up with us again. In spite of the temp in the high 90's, we still had one of the largest crowds of the season. There were a number of "moments" that were extremely moving. Some great songs and emotions came out as the sun went down and the evening settled in. Those us who serve as hosts agreed that God uses us in amazing ways when we just get out of His way. Pickin' on the Patio has proved to be one of those avenues. I can't believe that there are just four more Monday nights until we pack it away for the season.